Mandie Holgate, Author of Fight the fear - how to beat your negative mindset and win in life, Lupus doesn't stop me, speaking, coaching, blogging and changing lives. How to get out of hell and into happiness. The person in front of me glared at me and I was not sure if she was going to hit me or sob on my shoulder. Her face was contorted with stress and her words were so fast paced I’m not sure even she knew what she was saying. Welcome to the overwhelmed overloaded overworked new client. This person has a business, children, a partner, a dog and a rabbit – all of which would suffer if they left. If you have ever felt like you are about to meltdown. Scream something terribly rude in a bank queue or in the middle of the street or have poured a cup of tea in your handbag by mistake (yes, one client did that!) then you are probably facing extreme stress, feel like you need a holiday and are at a high risk of burn out. What can you do to pull back from the brink? To not feel like you need a holiday every other week? To get everything done and not stress about work all of the time? It’s just something you do. You don’t want to let someone down. You don’t want people to think you don’t care. You would hate people to think you can’t do it and aren’t capable. You are worried people think you aren’t coping. Guess what? You aren’t coping! If I say no in my head I feel like I’m failing. If I say no to someone I feel like they are judging me and then I judge myself in the same ways. It’s usually enough to bring their mind back to the focused accountable coaching and they learn to use that powerful little word. Recently I was working with a team of passionate dedicated leaders who obviously cared deeply about each other and the company they worked for and yet they were adding an impossibly long list of tasks to their working week that just didn’t need to happen. By looking at what they were thinking they realised that they were over thinking what other people would think about them. A great little idea they decided on was the thumbs up emoji. On Facebook you have the option to reply with this emoji and the group decided that that meant to them “Thanks, I’m up to date, now with love and respect can you go away I’ve got work to do.” This made them all laugh and they could see that it would stop any more emails being sent and they could get on with their work. However had that coaching conversation not happened the email pingpong would have continued and a team of leaders could have kept on feeling ready to rip their hair out and scream in the corner. Take the time to look for the things you think that aren’t true and how they impact on your actions in a negative way. What are you going to do about it? You let them do that to you??? In my book Fight the fear I talk about “Can you Justers.” They are the people far less likely to suffer from overwhelm because they are very good at moving tasks on to someone else. Look out for these Can you Justers in your life. They take advantage of those nice people who are true team players and want everyone to succeed. They also can be hiding their lack of skills or fears around tasks and so instead of dealing with them, they get someone else to do it for them. Quite clever really, but deadly for you. You never have to be rude or confrontational however there are some great ways to be able to get the Can you Juster to take responsibility for themselves and give you back some much needed space. I’m sorry I can’t help you this morning, however I’m free this afternoon. Is it okay if you don’t call me between 9 and 11 tomorrow because I have an important document to work on. Thank you. I’m sorry however unless it’s an emergency I don’t answer work calls or emails after 9pm or at weekends. 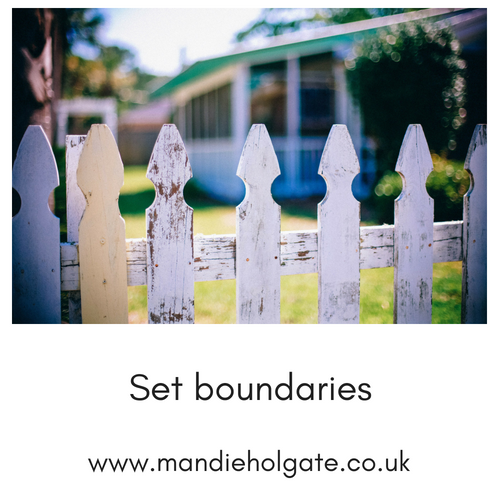 Boundaries help define how you work, how you live and what people can expect from you. Where we lack boundaries people often feel put upon, overworked, stressed, unrespected and like they should quit. It’s not a weakness to set boundaries, it’s a strength. If you fear this, then talk to the team, customers, suppliers, etc that you work with and ask them what would work for them and you. Not one or the other. When you are on the brink of falling off of your world, check out what you allow into your head. Ever really listened to the news or the weather? Years ago the emotional words and words with hidden meanings weren’t used. So you didn’t get the weather presenter telling you it’s a dreary day out there. They’d say “wide spread drizzle.” Or “prolonged rain” Not “It’s going to be a miserable day out there.” What does that do for your mindset at the start of the day? There’s plenty of countries in the world that would happily have a big down pouring. Water is the sustainable element in our world that we are all reliant on. And it’s not just the weather that falls foul of this. News presenters will often add words in that are there to make us feel an emotion about what is being said. Listen for them and it becomes quite shocking how the news is skewed. Remember that nothing sells like bad news so you aren’t going to hear the kind of stories that The Good News Network shares. India Has Saved Thousands of Lives by Increasing Sanitation Coverage from 40% to 90% in Just Four Years! Good News, Inspiring, Positive Stories . There are so many external influences that we allow into our heads. I was working with a client recently who said that other people’s driving infuriated them. I asked them how driving to work impacted on their day and the client told me how if they’d been cut up or had a tail gater trying to get in the boot of their car that their work colleagues knew because they didn’t walk into the office, their coat tails were literally flapping and their feet could be heard across the office booming like giant foot falls. And yes, their whole day could then escalate into a day of things not going right and “idiots wrecking their day” Why would you let something out of your control wreck your day? Get the junk out of your head. Your body – The computer – yeh right! Have you noticed that just before you go on holiday you feel like just getting out of bed has become hard work? Or that you seem to pick up every illness there is? That’s your body giving you a physical sign your body is not coping and it’s one you ignore at a high risk. Trust me the body eventually shouts at you “You didn’t listen to me when we got that bug, so now here’s glandular fever, the flu, a heart attack, adrenal fatigue.” The list is long and if you don’t listen to your body you will start hearing from it. I think some people think that they are more successful and diligent if they work ridiculously long hours. Like it is something to be proud of. Assuming it’s some warped badge of honour. As one business woman proudly replied to my announcement that I was popping out for lunch “Lunch? Lunch is for wimps!” I couldn’t believe anyone in the 21st century could have such a ridiculous idea of what was good for success (and health and happiness for that matter.) So much evidence points to the benefit to having a break. It’s not just good for your body it’s good for your creativity, problem solving skills, productivity and even IQ! I will stick with my lunch break thanks. I was working with a client who wanted to deal with their procrastination because it was making them stressed. And stress out of control is well on the way to burn out. Interestingly while there were elements of procrastination impacting on them they discovered that when they put off writing a report to do the washing up (which clearly wasn’t as important as getting the report in before the deadline) they realised that they were actually creating a few moments for their brain to process what would be needed. The re-framing of their actions enabled them to see that this was in fact a useful way of ensuring when they started that they got the job done. Look for the procrastination in your life. In my experience there is usually a fear hidden there. Find the fear. Fight the fear. And “magically” the procrastination disappears. And if your plan to deal with the procrastination is complicated it’s highly likely you will fail. 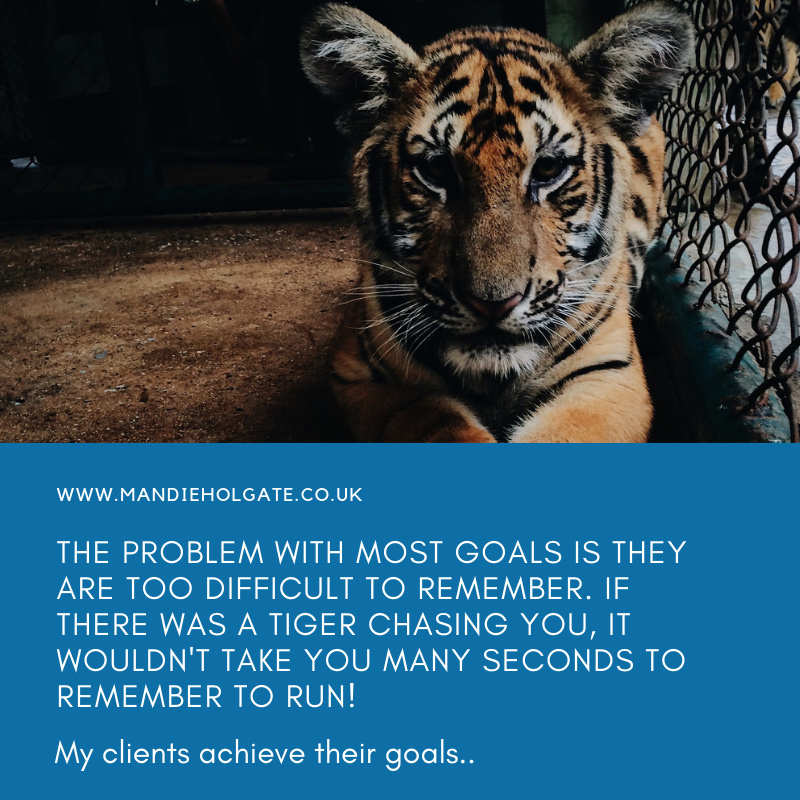 As I said on social media the other day – if there was a tiger chasing you it wouldn’t take you many seconds to work out you needed to run. Keep it simple. Not all things can be changed, fixed or controlled. And lastly feel the pain. Many of the ideas I’ve shared here help you to understand what is happening, take ownership for it, really feel the pain, create a plan of action and enable change. Without really feeling that pain and understanding how it impacts on you and your life then you will struggle to stay motivated and could easily drift back into overwhelm, overworking and being overloaded and we don’t want that. Thanks for reading. I love social media and I’m happy to connect. I share a ton of free ideas and I’m happy to tailor videos, articles etc to your needs so do feel free to get in touch.